Peggy Smith of Cowgirl Creamery arranges the array of cheeses to be sampled at the seminar she and Sue Conley presented. Is it possible to have too much of a good thing? At California’s Artisan Cheese Festival this weekend, the answer, happily, was a resounding yes. Over a period of five and a half hours, I tasted 24 excellent cheeses and sampled 14 wonderful wines, the best the Golden State has to offer. But by then it was still only 3:30 in the afternoon—and there was an eight-course feast still to come! My only choice was a nap, and a long walk through the wetlands south of the Sheraton Sonoma in Petaluma, about an hour north of San Francisco, venue for the fourth annual California’s Artisan Cheese Festival. 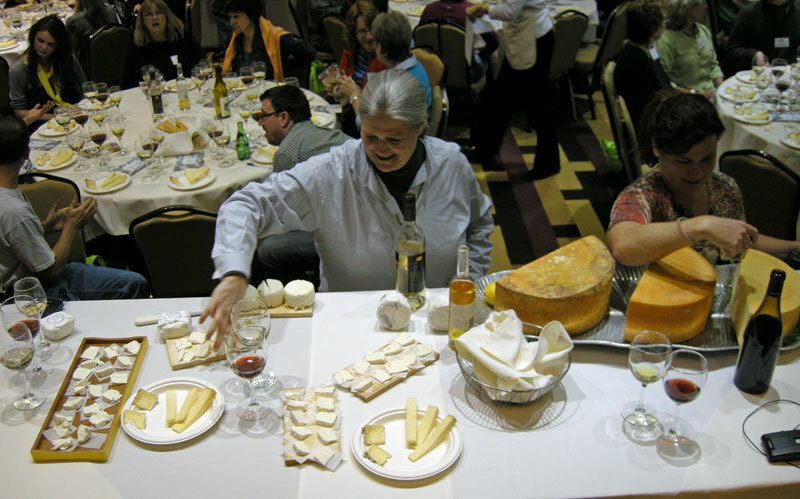 All along I’ve known that a successful cheese festival would be a mix of educational seminars, entertaining speakers, social events and a vendor marketplace–with lots of great cheese, wine, beer and food to sample. Here in Petaluma I’ve seen all the ingredients at play in a first-class event. For an event promoter, it’s been downright inspirational. Getting to meet the icons of California cheemaking, Peggy Smith and Sue Conley of Cowgirl Creamery, was simply icing on the cheesecake. Cooks, Curds & Cuvées was the grand finale of a day featuring too much of a good thing. 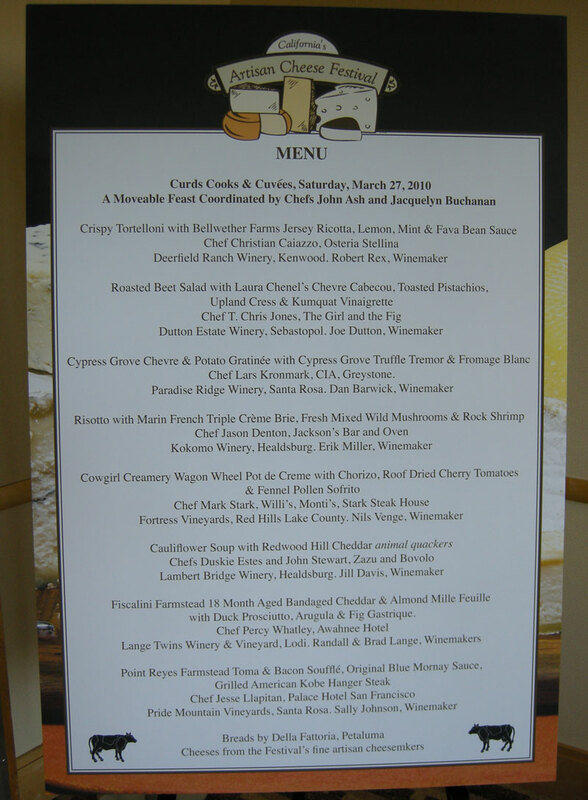 Click on the image for a clearer view of the menu. Julia Rogers offers a sampling of goat cheese to her class at Leslieville Cheese Market. A great way to become familiar with any type of cheese is to spend an evening discussing its history, production, and taste while nibbling on prime examples. This I learned while attending Julia Rogers’ Night School for Cheese Fans class on goat cheese which she delivered to a packed house of 20 at the Leslieville Cheese Market (East) on Thursday. While I would classify myself as a cheese fan, I am more likely to show my appreciation by devouring large amounts of the stuff than by carefully contemplating the smell, taste and texture of a cheese. Julia taught me the error of my ways as we ate our way through five goat cheeses and discussed each one individually. Learning the history and the specifics of the cheesemaking process helped to build an appreciation for the cheese that went beyond the pleasure of eating it. I was impressed to learn goat cheese made its way to France in the eighth century, and was produced at almost all family farms. It seems everyone had a goat or two kicking around the farm, and families took advantage of this by churning out their own cheeses. As a cheese-tasting neophyte, I benefited greatly from the guidance of an expert. Julia suggested subtle undertones that could be detected in each cheese, and encouraged students to concentrate while tasting, in order to discover delicate flavours on their own. Her expertise was also helpful in suggesting suitable wine and beer pairings for each cheese, as well as dishes that could be improved by the addition of a goat’s-milk cheese. I was amazed to discover how much cheese appreciation has in common with wine tasting. Where I would normally pop a piece of cheese into my mouth without much thought, Julia insisted I give attention to the nose, texture and acidity of each goat cheese. This certainly helped to enhance my enjoyment of the cheese. We sampled cheeses from France, Holland and Canada, and I am pleased to say my favourite was Chevre Noir from Chesterville, Quebec, an 18-month-old tangy cheese. I was surprised to learn it was a goat’s-milk cheddar. Before the class, I hadn’t realized goat’s milk could be used in a variety of cheese types, including cheddar and blue. The history of goat cheese in Quebec was interesting to learn, mainly because it is such a short history. Goat cheese production didn’t take off in the region until the early 1980s. Prior to that, goat’s milk was primarily produced for hospitals, where it was fed to premature babies whose underdeveloped digestive systems were better able to process the small fat molecules present in goat’s milk. 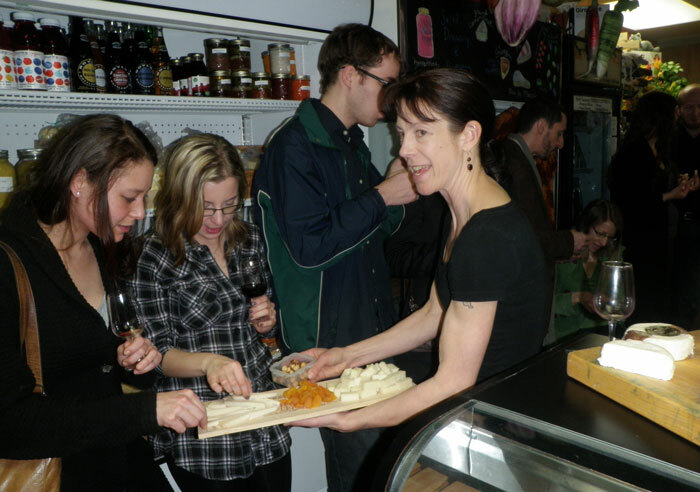 When the tasting was complete and the wine had run dry, many students hung around to ask Julia their cheese-related questions. 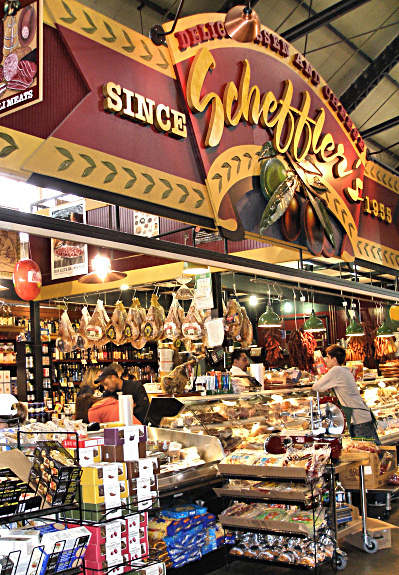 My tasting companion and I chose to press ourselves through the crowd to the cheese counter, where we took advantage of the 10-per cent-discount offered to attendees by snapping up three goat cheeses. And a new batch of goat cheese lovers was born. Phoebe Powell recently returned to Toronto after traveling for three months across Asia where she found few opportunities to sample cheese. 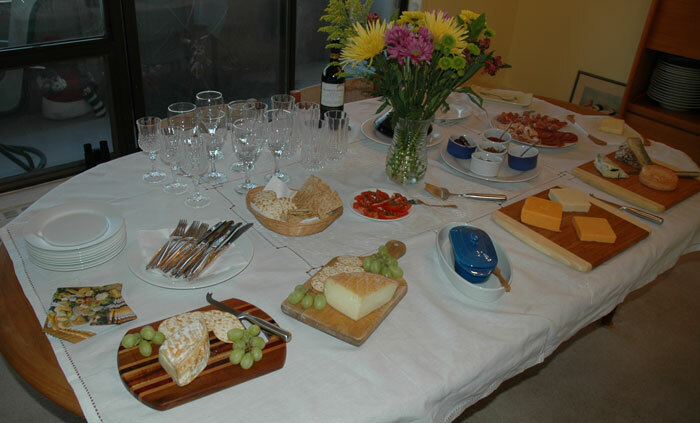 Five cheese courses are lined up, awaiting our guests. One of the great cheeses of Canada, it’s made from raw cow’s milk on a small island— Île-aux-Grues—in the middle of the St. Lawrence River about 40 miles down-river from Quebec City. Riopelle de l’Île is named after Quebec’s most famous painter, Jean-Paul Riopelle, who lived on the island for two decades until his death in 2002. He lent his name to the cheese, and provided the artwork that adorns the packaging, on the condition that one dollar for each wheel sold by Fromageries Île-aux-Grues would be donated to the island youth foundation. A soft triple-cream cheese with a bloomy rind, Riopelle melts in your mouth and has a wonderful taste of hazelnut, mushroom, a hint of butter and a pinch of salt. Chris’s Cheesemongers, $6.15 per 100 grams. I’m so proud of “my” cheese because the two times I’ve shared it, guests have said it was their favorite. This is the Bonnie & Floyd that I was given in November after spending a day learning how cheese is made at Fifth Town Artisan Cheese in Prince Edward County. Despite my difficulties in finding a spot in our apartment building to age the cheese at the right temperature and the right humidity, my Bonnie & Floyd turned out to be a real treat. Just like the cheese aged at Fifth Town, mine has a smooth paste with complex yet mild mineral flavours. Barely salty near the rind, and somewhat nutty, it provides almost sweet lactic flavours near the centre. When I first cut into the wheel, I couldn’t believe how fresh and milky it tasted, a testament to how well the ewes who gave the milk are treated, and the speed with which the milk moves from farm to cheesemaker. My sister gave us a lovely baking dish for Christmas together with a small log of Woolrich Dairy goat cheese and assorted herbs. After 20 minutes in the oven at 350F, it was a striking addition to the assortment of flavours on our menu. It was nearing its best-before date, so was well aged, and most of our guests laced it with honey. 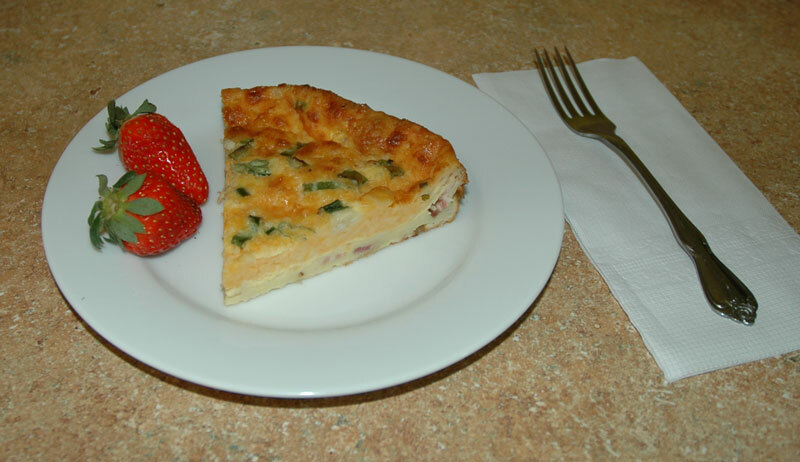 With a Parisian-style baguette, it was a light and tangy treat. We had purchased the Kraft “aged cheddar” as it was on sale at a ridiculously low price at Wal-Mart but had not yet found a way to eat it; thus, my bright idea of blind-tasting the factory-made cheddar against two artisan cheddars. It was no contest. Even sitting on the board, it was obvious which was the Kraft, but we proceeded with the blind-tasting anyway as it provided an entertaining twist to the proceedings. The five-year Wilton is a very nice cheddar. Perhaps because it has rested in our refrigerator for four months, we could spot the occasional crystal developing. For our tastebuds, the six-year Black River was the clear winner, so tangy and complex, so crumbly that after our guests departed, I made a snack of cleaning up the bamboo board. Guernsey Girl is a delightful new cheese that is unique to Canada and deserves its own blog entry (which will come after we have another chance to try frying the cheese. Yes, this cheese is fried or grilled before it is served). It’s an outstanding creation of Upper Canada Cheese using the rich milk provided by a herd of Guernsey cows on the Comfort family farm near Jordan, a Niagara Peninsula village. When we think of a rich and powerful cheese at our house, we think Époisses Berthaut from Burgundy in France. It’s a washed-rind unpasteurized cow’s milk cheese with a natural red tint and its own rich and penetrating aroma. When Cabrales, the great blue of Spain, is well-aged, it is fully potent—on the verge of overpowering the faint of heart. Our Cabrales was like that, even with a chutney or honey or fig jam, so ripe and so intense. I had told Geoff, a longtime cheesemonger at Chris’s Cheesemongers in St. Lawrence Market, that we wanted a strongh finish to our evening—and did he deliver! Geoff carved our wedge from a wheel that was obviously fully ripe. Heck, half the piece was dark blue! Our guests, who were as satiated was we were by evening’s end, barely tasted the Cabrales. Meaning Significant Other and I, over the coming week, must find ways to savour the strongest cheese we’ve ever tasted—or it will simply become too powerful, even for strong cheese lovers like us. Chris’s Cheesemongers, $7.34 per 100 grams. There was a loud groan from our full guests when we presented one additional variation on the evening’s cheese theme—cannoli—but six of the little suckers were devoured within minutes. For starters, Henry of Pelham Cuvee Catharine Rose Brut and an excellent Pillitteri Gewurtzraminer Reisling. Then, Henry of Pelham Pinot Noir and a delightful Conundrum California White Wine (blend). Concluding with Casa dos Vinhos Madeira and a knockout Cockfighter’s Ghost Shiraz that was a match for our Cabrales. With plenty of San Benedetto carbonated mineral water to stave off dehydration. Red pepper jelly, Latvian chutney, Kalamata olives, Ontario honey and fig jam from France. Green grapes and strawberries. Honey dates, dried apricots and walnuts. Kashi crackers, multi-grain flatbreads and plain crackers. Parisian-style baguette and a multi-grain baguette. We also offered tomato slices drizzled with Spanish olive oil and Modena balsamic vinegar and topped with a fresh basil leaf which worked exceptionally well to counter the buttery richness of Guernsey Girl. Le 1608 is a relatively new creation of Laiterie Charlevoix. A semi-firm, washed rind cheese, Le 1608 uses milk from Canadienne cows whose ancestors were brought to Canada from France starting in 1608. Most of these hardy animals are unique to the Charlevoix region of Quebec. What a mouth-watering, medium-strong, creamy blue cheese made from pasteurized cow’s milk in Auvergne, France! In retrospect, 11 cheeses over five courses were too much of a good thing. Four courses of maybe eight or nine cheeses would have been just fine. The experts usually say allow for 400 grams of cheese per person when serving cheese as a meal. We provided 485 grams per person. When all was said and done, close to 400 grams were consumed on average per person.